The Loantaka Brook subwatershed covers just over 5 square miles and is the smallest of our subwatersheds. The primary headwaters of Loantaka Brook flow just south of Parsons Village apartment complex and west of Woodland Elementary School in Morris Township. This tributary continues past the Morris Township municipal buildings, Ginty playing fields and pool and Seaton Hackney Stables. A second tributary begins near South Street in Morris Township and flows into Loantaka Brook Reservation, joining the main stem just downstream of the Woodland Sewage Treatment Plant. After the two main tributaries come together, Loantaka Brook is dammed to form Kitchell Pond in Morristown. After it exits the pond, it flows through Loantaka Brook Reservation for approximately three miles before entering the Great Swamp National Wildlife Refuge, where it joins with Great Brook at the end of Woodland Road in Green Village. 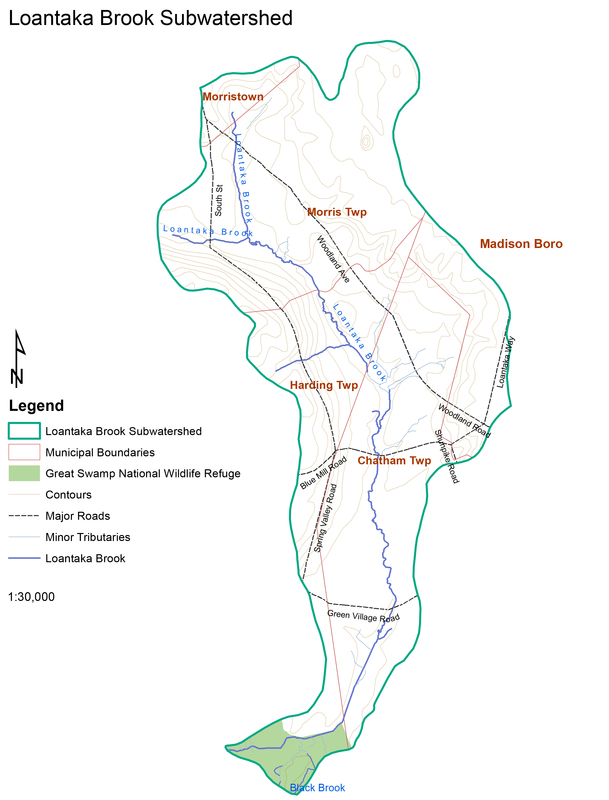 Loantaka Brook flows through Loantaka Brook Reservation, which is one of the most popular Morris County Parks. This park offers a wide range of recreational opportunities, including paved and unpaved trails along the banks of the brook that can be used for running, walking, cycling, and horseback riding. From 2005 to 2007, the Loantaka Brook subwatershed was the focus of GSWA’s first Adopt-a-Stream initiative. This three-year program consisted of intensive water quality monitoring on multiple assessment sites on Loantaka Brook and identified two key problems; an excessive amount of road salt near the headwaters and increased nutrients downstream of the Woodland Water Pollution Control Utility. The full report can be found here. Loantaka Brook is the most impaired stream in the Great Swamp Watershed. The heavily developed areas around its headwaters (53% of the entire subwatershed is developed) contribute to elevated nutrient and salt levels in the stream. Storm drains located throughout the subwatershed transport stormwater runoff, including road salt, fertilizers, and other pollutants directly into the stream. Excess water volume is also an ongoing issue in Loantaka Brook. The Woodland Water Treatment Plant discharges thousands of gallons of treated effluent into the stream channel every day. The discharge causes erosion downstream, undercutting buffer vegetation and scouring macroinvertebrate habitat on the stream bed. The 2015 Great Swamp Water Quality Report Card data continues to show Loantaka Brook as having the lowest macroinvertebrate population of all our streams. It ranks very poor in five of the categories monitored, including road salt, phosphorus, and bacteria. Visual assessments have noted increased sedimentation in the upstream areas further degrading wildlife habitat. Increased sediment and erosion: Planting native multi-stemmed plants such as shrubs at the bottom of sloped areas in your lawn can help reduce runoff speed and nutrient levels in the runoff. Also, breaking up large areas of mowed lawn with small gardens containing native plants can help. Road Salt: Use road salt only when necessary and consider using alternative compounds that are more environmentally friendly such as Calcium Magnesium Acetate (which is also pet friendly). High bacteria levels: Pick up after pets, even in the yard, and be sure to maintain septic tanks regularly.